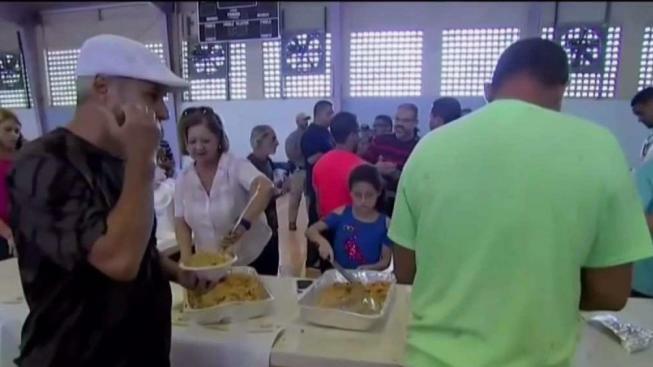 NBC 6's Sheli Muniz sat down with celebrity chef Jose Andres, who has provided millions of meals to people in a county still trying to recover. When Maria cut through the country in September, three million people were left without power while dozens died. Celebrity chef Jose Andres has spent weeks there – and the owner of Bazaar and Bazaar Mar in Miami has his own recipe for recovery. What started with one kitchen and a group of chefs in Puerto Rico just days after the storm would turn into 21 kitchens. It’s been nearly six months since Hurricane Maria barrelled through Puerto Rico, and families continue to put their lives back together, with some still doing it in the dark. Three million people were left without power and dozens died when Maria cut through the territory in September — and while most of the island is rebuilding, people from all over the country continue to help. Celebrity chef Jose Andres has spent weeks in Puerto Rico with his nonprofit World Central Kitchen, and the owner of Miami's Bazaar and Bazaar Mar restaurants has his own recipe for recovery, starting one plate at a time. What started with one kitchen and a group of chefs in Puerto Rico just days after the storm would eventually turn into 21 kitchens, thousands of volunteers and 3.3 million meals. “We never thought about the number. We just said this person is hungry, let's take care of this person, let's take care of this hospital, let's take care of the elderly, let's take care of the veterans,” said the chef. But Andres says they need help. He described his kitchen workers as amazing and never looking at the clock, but he wishes the red tape in coordinating with FEMA wasn’t so complicated. Andres says he’s seen this before – slow responses during other natural disasters, like Hurricane Katrina. “I believe that Washington should be smarter about giving Puerto Rico a fair path to success and right now it isn’t happening,” Andres said. In the meantime, he and World Central Kitchen will continue their work for a few more months, give grants to food trucks and help small farmers. “Food is complicated and we were able to do a lot with almost nothing,” he said.